When John Carpenter’s remake of The Thing premiered in 1982, and was mostly rejected by both movie-going audiences and critics, an afterlife on home video was all but inevitable. Through CED, Laserdisc, VHS, and DVD, the movie, like several that John Carpenter made that weren’t fully appreciated upon their initial releases, built an avid following, with many people in that following proclaiming it to be “the best movie John Carpenter ever made” and/or “the best monster movie ever made.” Besides just the fan base, industry insiders, fellow filmmakers, and even the director himself have even spoken about how it’s possibly the best piece of work that he’s ever been a part of. And with an illustrious, career-spanning catalogue of work that includes the genre classics Halloween, Assault on Precinct 13, The Fog, Escape from New York, Prince of Darkness, They Live, Christine, Big Trouble in Little China, and In the Mouth of Madness, that’s most-assuredly high praise for one single pearl in a very beautiful necklace. The Thing is technically not a remake in the sense of the word, but more of a re-imagining of the original short story “Who Goes There?” by John W. Campbell, Jr., which Howard Hawks’ The Thing from Another World was also based upon. That original film wound up having not much to do with the actual story, with the alien simply being reminiscent of Frankenstein’s monster. While it worked in 1951, and is still heralded as a sci-fi horror classic, Carpenter’s update certainly eclipses it. The story is about a group of men at a U.S. Antarctic outpost. They learn that another group of people, at a Norwegian base nearby, have discovered a flying saucer buried under the ice, and have brought one of the alien bodies frozen in ice back to their base. But with no one left alive there but one of the base’s dogs, they soon realize that the creature that was unearthed must be walking amongst them. No one knows who to trust, as each of them are being killed, one by one, and almost perfectly replicated by the alien creature. Truth be told, there isn’t much you can say about The Thing that hasn’t already been said. It’s a technical marvel in every possible away, from the spectacular cinematography of Dean Cundey to the amazing prosthetic and make-up effects by Rob Bottin, as well as additional work by Stan Winston and stop-motion animator Randall Cook. There are wonderful performances by Kurt Russell, Keith David, Richard Dysart, Wilford Brimley, Richard Masur, and the other men of Outpost 31. There’s also a very moody and effective score, which is a combination of work between John Carpenter and Ennio Morricone, that uses atonal cues to create mood and atmosphere... of which there is an enormous amount here. All of it combines to create one of the finest science fiction horror movies ever made. Scream Factory’s Collector’s Edition Blu-ray features a brand new 2K scan of the film’s interpositive element, supervised and approved by Cundey. The results are absolutely spectacular. The Thing has never looked as pristine, clear, detail-oriented, and organic as it does in this presentation. Pre-DVD and Blu-ray, this film has always been a bit on the murky side, due to the darkness of the cinematography. And while the previous Blu-ray release of the film was quite good, there was room for some improvement in terms of clarity and both black and grain levels. Scream Factory’s disc surpasses it, and is practically immaculate, featuring an extremely organic-looking presentation with very light and even film grain throughout. Detail, including skin textures, clothing, prosthetics, make-up, and both foreground and background elements, are richer than ever. Colors are stronger and more well-defined than before, including terrific skin tones. Black levels, one of the most important aspects of this film, are virtually perfect with amazing shadow detailing, revealing even more information than previously seen without spoiling the aesthetic set forth by Cundey. Contrast is perfect as well and there’s next to no film damage other than some extremely mild speckling and light fading along the left and right edges of the frame. Nor is there any signs of digital augmentation or enhancement. The only thing that comes close to being a flaw is the shot of the ‘United States National Science Institute Station 4’ sign at the beginning of the film. It looks a little rougher than the rest of the footage and features some heavier fading along the edges, specifically at the right of frame. But that is small potatoes in what is an otherwise perfect presentation and transfer. 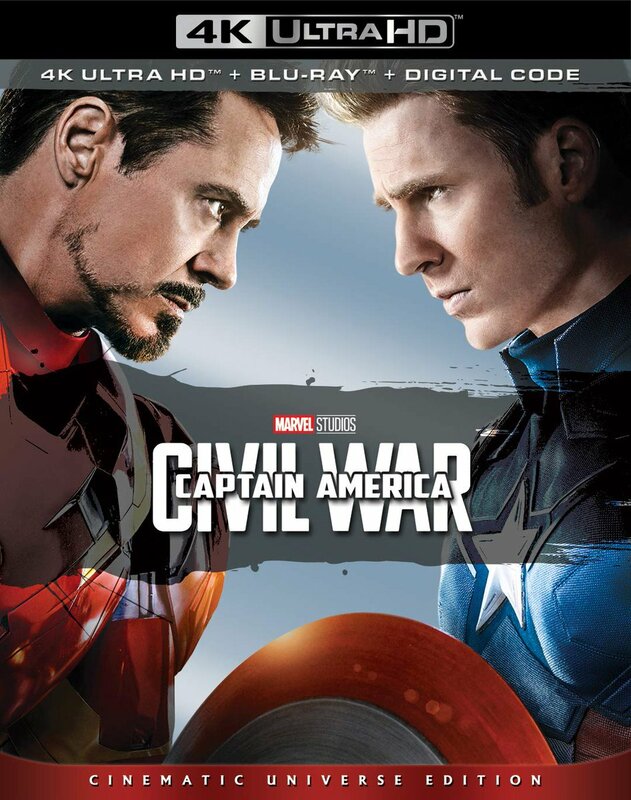 For the audio, there are three options: English 5.1 and 2.0 DTS-HD, and a brand new 4.1 DTS-HD mix created from the original 70mm six track Dolby stereo soundtrack. Like the visuals, all of the audio tracks are top notch, but the real winner of this grouping is the new 4.1 track. Dialogue is crisp and discernible at all times, while sound effects, music, and score have new life to them. There is a wide field of sound at all times, with plenty of ambience and speaker-to-speaker activity, as well as some amazing low end moments involving the score and the creature sounds. As a matter of fact, all of the audio effects (even if they are a tad dated) sound as vibrant and strong as ever, particularly during some of the squishier, gorier moments, such as the scene when Blair dissects the dead monster brought back from the Norwegian base. The other tracks pack a punch and are very well-mixed, but the new 4.1 track truly breathes new life into the film. All told, this is the best that The Thing has ever looked and sounded on home video, bar none, and it stands as a precedent for what can be accomplished when transferring a film of this vintage. Note that there are also subtitles in English SDH for those who might need them. Reviewer’s Note: Shout! Factory announced, prior to street date, that some syncing errors had been found within the main 4.1 audio of the initial pressing. We double-checked this and, indeed, these errors could be heard several times during the blood testing scene. Upon this discovery, the company immediately pushed back the street date (from September 20 to October 11) in order to fix these issues prior to the final release. Obviously, the syncing issues did not throw the entire film out of sync, and they were not so terrible that our review couldn’t be carried out. Rest assured, we now have the corrected release in our hands and we can confirm that these issues have been addressed and corrected. Just to be clear, all official release versions will not contain these errors – only the initial discs given to the press. Our assessment has not changed and the audio track is terrific. If you’re into this Blu-ray for the extras, it’s safe to say you can retire any previous DVDs or Blu-rays you might still be holding onto. Not only does it carry over everything of note from previous releases, but it’s also stuffed with a ton of new material too. On Disc One, you’ll find two new audio commentaries: one with director of photography Dean Cundey, which is moderated by Rob Galluzo, and the other with co-producer Stuart Cohen, which is moderated by Michael Felsher. Also included is the fantastic audio commentary with John Carpenter and Kurt Russell. In addition, there are two U.S. theatrical trailers, the German theatrical trailer, the teaser trailer, 3 TV spots, 4 radio spots, and an extensive set of still galleries (behind-the-scenes, lobby cards and press stills, programs, posters, storyboards, and production artwork). 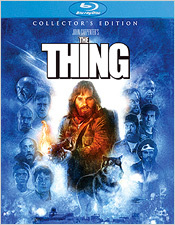 On Disc Two, the rest of the extras are split into three subcategories: Interviews, Featurettes, and More of The Thing. Under Interviews, there are five brand new items to choose from, including Requiem for a Shape Shifter, an interview with John Carpenter in conversation with Mick Garris; The Men of Outpost 31, which includes interviews with nearly all of the main cast other than Russell; Assembling and Assimilation, an interview with editor Todd Ramsay; Behind the Chameleon: The Sights of The Thing, which is an extensive set of interviews with many of the film’s visual effects artists and special make-up effects artists; Sounds from the Cold: The Sound Design of The Thing, which contains interviews with supervising sound editor David Lewis Yewdall and special sound effects designer Alan Howarth; and Between the Lines, an interview with novelization author Alan Dean Foster. Under Featurettes, you’ll find two new animated still galleries: The Art of Mike Ploog and Back Into the Cold: Revisiting the Filming Location of The Thing, the latter of which is narrated by Todd Cameron of Outpost31.com. You’ll also find a set of outtakes (more like deleted scenes); a set of 9 vintage featurettes from the film’s original Electronic Press Kit, featuring interviews with Carpenter, Russell, and special make-up effects artist Rob Bottin; a vintage product reel, which is a condensed version of the film with footage not used in the final cut; a brief bit of vintage behind-the-scenes footage shot for publicity purposes; and an extensive annotated production archive, which includes production art and storyboards, location scouting, special make-up effects, and post production – all of which has been culled from previous Laserdisc and DVD releases. Under More of The Thing, you’ll find the network TV broadcast version of the film, which features additional, deleted, and alternate footage, dialogue, and music cues in standard definition (some of which is also present in the featurettes and outtakes); the long-form making of the John Carpenter’s The Thing: Terror Takes Shape documentary; and two additional vintage featurettes: The Making of a Chilling Tale and The Making of The Thing (the latter of which is directed by Mick Garris). Every last bit of this material is completely exhaustive, entertaining, informative, and will take you hours to get through. Almost no stone has been left unturned. This release has the rare distinction of being one of the most complete and satisfying sets of supplemental materials for any release of any film ever. To say that Scream Factory has created their finest Blu-ray release ever here would be an understatement. There are almost no faults to be found, nor is there any content that hasn’t been carried over. To boot, the new content is equally satisfying, as is the outstanding video and audio presentation. If you were on the fence about having to purchase this film again, rest assured that this is the essential release of The Thing on Blu-ray Disc. Highly, extremely, and utterly recommended!